I have seen many people just whip up a resume in a matter of minutes and call it a day. Fact is, your resume is important. If the interviewer doesn’t personally know you, then your resume says a lot about you and your work history. 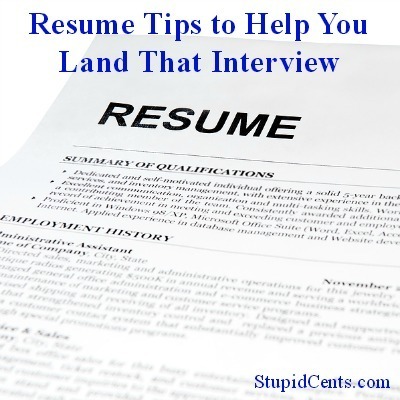 Your resume is what can help you get a job. Yes, there are many people out there who say that resumes over one page are too long. However, this all depends on the industry in which you work in. Certain industries want longer resumes, and fitting everything onto one page may be near impossible. Find out what is standard in your industry and go from there. If you come across the chance that you have one full page and only one or two lines on the second, this is where you definitely need to just get rid of the second page and justtry to cram everything the best way into only one page. Saying that you have done something is great, but you should actually quantify your accomplishments. If you helped increase sales a significant amount, showcase that with an actual number figure or on a percentage basis. This shows that you are not just inflating your position and that you can produce good results. If you tailor your resume to a specific position or company, it shows that you are going the extra step to land the job. I have seen so many resumes with basic mistakes. After you read something so many times, you may not be able to catch mistakes as well. This is where a second pair of eyes comes in handy. Sugarpie123@aol.com doesn’t exactly scream professional to many people. Actually, I can’t think of anyone who would see that on a resume and not laugh. Create a generic e-mail for yourself, such as JohnSmith@gmail.com. Gmail also looks more professional than a Hotmail account, so please keep that in mind as well. No one likes a liar. Do not lie on your resume. If you get caught, you most likely will not get the job. And if you get hired because of the lie, then you will most likely get caught because you will probably have no idea how to do the task that you lied about. Save everyone time and tell the truth. Your font on your resume matters. Make sure that it is a standard font (such as Arial or Times New Roman) and something that everything can read. You don’t need to go fancy or show your font picking skills. Also, make sure that your font is large enough. Usually size 12 font is perfect. This rule may not apply if you are applying for a creative job though. These fonts may be considered too boring. Make sure that you update your resume regularly so that your resume is always fresh. You never know when you may need your resume at the last second. Also, keeping it fresh will help you more easily remember your accomplishments. What resume tips do you have? What big resume mistakes have you seen? Great tips! I recently helped my boyfriend make a paper resume – he’s a developer and has never had a need for one previously – and he was astounded when I told him it didn’t have to be just one page! If you have enough useful info, that second page can be important. Thanks for the article! Actually, I don’t agree with the standard font one. Part of my job is hiring people for different positions and when I’m reading through 100 resumes, different font stands out. You have to make sure to do it right though – it has to be just as legible at Courier, Ariel or Times New Roman, but just a little different. I actually took the time to read through an entire resume of some random guy just because he used a “typewriter” font that was clear and easy to read, but not that same font I’d been staring at for 2 hours. Great point about using numbers in your resume. Several recruiters have made that point to me when looking for work. They wanted to see hard numbers versus just verbiage. Great point about using hard numbers. Many professional recruiters have told me the same thing. Employers want numbers and facts, not fluff.